This is the registered version of MartinSoft Pengo, which was released as freeware in December 1996.
you have Internet access, get it from Aminet (game/shoot). Anyway, in August 1993, I thought it'd be a good idea to make a "proper" version of Pengo for the Amiga (let's just say that the GW-BASIC version for the PC wasn't very smooth-moving), so I started programming on MartinSoft Pengo. As you can see, it's taken more than 4 days to finish it. MartinSoft Pengo is the most "polished" game I've written so far, gameplay- and presentation-wise. The main reason for it taking so long, is that I started studying Computer Science at the Chalmers University of Technology in Gothenburg; and that has taken more time than I thought it would. So I've spent the last year neither studying nor programming as much as I should :-). 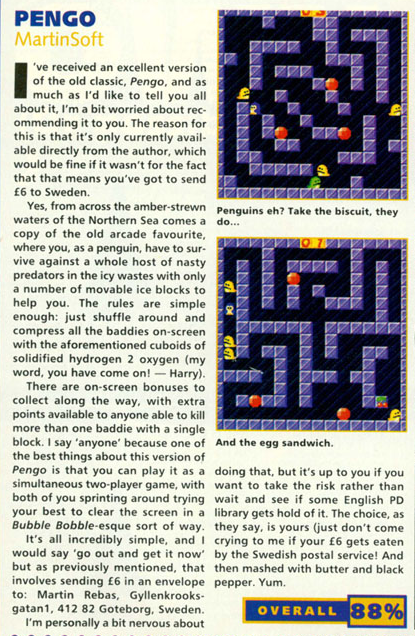 As it's been a while since I last played the original Pengo, I have not tried to make a game that's very true to the original (simply since I don't remember that much of it). I've taken the basic idea of Pengo as I remember it, and added a lot of Bubble Bobble to it. Compared to the arcade version, MartinSoft Pengo is probably faster, and with more bonuses. It is also (as far as I know) the first Pengo-clone that features a simultaneous 2-player mode. MartinSoft Pengo has been developed on an A1200, and has been written in 100% assembly language. The highscores are saved when you exit the game. 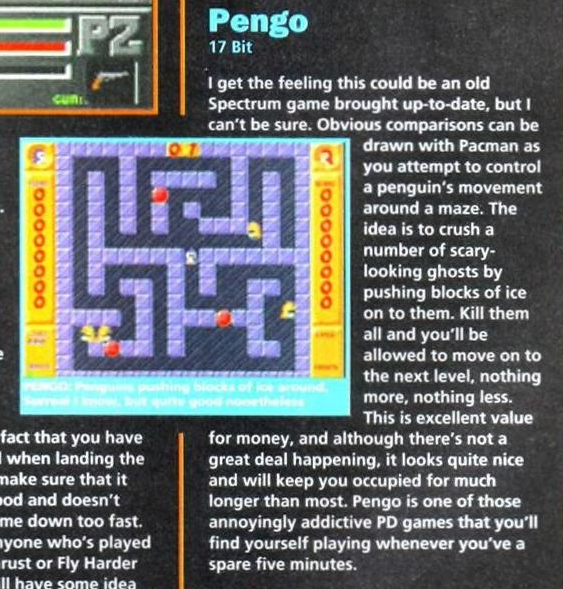 Pengo is a maze game. The maze is made out of ice blocks, which you can push or melt. Blocks are melted by pushing a block that has another block directly in front of it. If that sounds confusing (and it probably does), play the game, and you'll understand what I meant. The ice blocks that form the "border" around the maze can't be pushed or melted. Also, on some levels there are special gold blocks, which can't be moved. makes it possible, try to "trap" the enemies into small spaces; that will make it a piece of cake to squash them. Generally, trying to limit the ways that the enemies can take (by pushing blocks to the right places) is a good tactic. Learning the different movement patterns for the enemies is also essential; the yellow ones are pretty easy to outsmart without understanding how they move, but the red ones are professional escape artists, and almost impossible to hit if you don't understand their "AI". If you spend too much time on one level, a ghost will appear and start to home in on you. The ghost can't be killed - but it will disappear as soon as you get to the next level. If it catches you, you will lose one life, and it will disappear for a while (the ghost, not the life :) ). If it catches you while you're "invisible" to the enemies, it will simply remove the invisibility and disappear - but it will re-appear very quickly. 1. Squashing all enemies on the level with ice blocks. 2. Pushing the three ruby blocks together so that they form a horizontal or vertical line. 3. Getting a warp bonus of some sort. Method nr 1 is recommended, as it's the most fun. Squashing many enemies with one block will give more score than squashing them one by one. There are also lots of bonuses and bonus systems in the game, but I won't reveal them here (which would spoil the surprise). Find out about them yourself! "TAB" will switch the computer between PAL/NTSC mode. F1 or player 1 fire button: Starts 1-player game. F2 or player 2 fire button: Starts 2-player game. F3 shows the credits for the game. F4 shows general information about the game. F5 shows greetings to certain people as well as some ads. F6 shows the high score list. F7 shows the HAM-mode title pic. If you watch any of the above screens (F3-F7), you can return to the title screen by pushing Escape or fire button. You can also use the joystick for pausing/speeding up the scrolling. F10 exits the game. I chose not to use Escape for this as people may accidentally hit Escape twice while exiting some "sub-screen" - thus having to reload the whole game, which isn't all fun if you're playing from floppies. Moving joysticks connected to gameport 0 or 1 will move the penguins :) . Push blocks by pushing the fire button. You don't need to move the joystick and push the button simultaneously - simply push the button, and the penguin will push/melt the block towards which it is facing. (That may seem obvious, but one of my playtesters made that mistake at first). "P" will pause the game. Push "P" once again to continue playing. "M" will turn in-game music on/off. But please don't turn it off - the game loses a lot of its atmosphere if you do. (The "Popcorn" tune was also in the original Pengo). "Q" makes you lose one life and restart the level. "Esc" will end the game and return you to the title screen. "F10" will exit the game. so this can't be done. If you have a monitor, use PAL. Since a NTSC screen updates at 60 Hz instead of 50 Hz, that gives the Amiga less time to calculate/blit everything. As MartinSoft Pengo was originally meant to be PAL only, this means that in NTSC mode, the screen update can slow down to 30 Hz if a lot is happening on screen (boss stages, typically). To prevent this from happening, I've included an extra option - push "A", and, if you have an AGA machine, the screen update should magically be 60 Hz again. (If you don't have an AGA Amiga, the screen display will probably get messed up, but don't worry - pushing "A" once again will fix it). This feature takes advantage of the AGA "DMA burst" mode, which speeds up DMA transfer to the screen (or something like that). (If you've pushed this button, and are staring in horror and disbelief at the picture of me - yes, the photo of me has been edited. I tend to have slightly smaller eyes as well as a slightly smaller mouth in real life). If you've got a non-AGA Amiga, and wish to run Pengo in NTSC mode- be aware that it may slow down at certain places. If you've got an NTSC Amiga, and a monitor, push TAB, which will turn your computer to PAL mode. If you've got an NTSC AGA Amiga, and no monitor, push "A", which will speed up the screen update when necessary. If you have any other computer setup, everything should be ok.
Also note that the key "G" has no function whatsoever in this game. MartinSoft Pengo can be installed on a hard disk. Simply copy the files to wherever you'd like to have them. Not that hard, was it? Just make sure you've got enough chip memory available when you try to start it; to run Pengo, you need about 780k of free chipmem. If you can't start Pengo, try disconnecting extra drives and other peripherals; then reboot - that should free some memory. If you only have 512k of chipmem in your Amiga, you will not be able to run MartinSoft Pengo, no matter how much fastmem you have. This piece of software is provided "as is", without warranty of any kind, either expressed or implied. By using "MartinSoft Pengo" you agree to accept the entire risk as to the quality and performance of the program. If MartinSoft Pengo makes you lose both your job, house and girlfriend, I will take no responsiblity. But make sure you write and tell me about it, 'cause I'd love to hear how it happened. That ought to be everything.